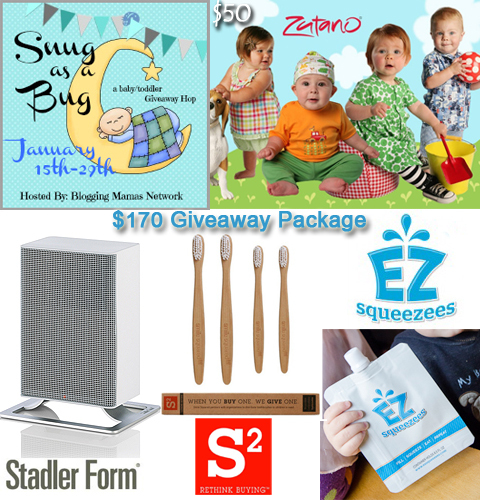 Welcome to the Snug as a Bug Giveaway Hop, hosted by the Blogging Mamas Network. With the cooler weather coming strong, I’ve joined with over 40 other bloggers to bring you great products to keep your baby snug as a bug! Each blogger participating has a great Baby/Toddler Prize Package for you to win, worth at least $25, so after you enter mine, be sure to hop around to all the others in the linky! Don’t forget to enter to win one of the GREAT GRAND PRIZES for the Event as well, including a Beco Baby Carrier, Kowalli, and The First Years Feeding Prize Pack! $50 gift certificate to spend at Zutano on baby clothing up to 4T size! See our previous review. Winner will receive the Anna Little Heater ($79.99) to keep their baby snug as a bug! See our review. Winner receives a pack of four Eco-friendly bamboo toothbrushes in their choice of size. See our review. Winner receives 6 reusable food pouches perfect for on the go with your own fruit/veggie purees, yogurt, and more. See our review. According to Jenny, So Easy Being Green, and the Snug as a Bug participating bloggers are not responsible for sponsors who do not fulfill prize obligations. Disclaimer: I did not receive payment for this post. The products featured in the giveaway were provided to us free of charge for review purposes. The $50 gift card to Zutano! I am most excited about the bamboo toothbrushes! Thank you! oh man I can't decide! We NEED the heaster for LO's room, but mommy would LOVE the refillable pouchies for his homemade purees! I am excited about the Zutano GC! I love the EZSqueezies! Great for messy snacks! I am most excited about the Zutano gift card! Thanks for the chance! The $50 Zutano gift card! I'm most excited about the heater! I'm most excited about the gift card. Thanks. I am most excited about the EZSqueezees!! We make all of our own baby food, but the pouches are just so convenient when out and about! Best of both worlds! I am excited about Zutano! I love their adorable prints and colors! I am excited about the Zutano gift card! The fifty dollar giftcard to Zutano! I am most excited about the heater. They are all FABULOUS prizes I would say the reusable pouches have to be my favorite. With a little one who loves to feed herself they would be perfect. I am most excited for the Zutano Gift Card. Zutano, ez squeeze, toothbrush, heater... all of them, in that order! The heater. My room gets cold and while we don't currently sleep in there, it's where I keep my baby's changing table and potty (for EC) I know I'd appreciate some warmth in there for getting showered and dressed and I know she would too. Most excited about the Zutano gift card. I <3 their styles! The heater! But, they are all wonderful prizes! Excited about the EZSqueeze and the bamboo toothbrushes. 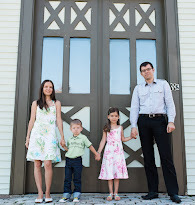 I'm excited about the Zutano GC- love their clothes!! I am excited about the heater!!! I'm most excited about the heater! Our bathrooms are freezing, and I've been wanting a heater for bath and shower time! The Zutano gift certificate, I love their clothing. I'm most excited about the heater!! I am most excited about the Zutano GC. would love the gift card to zutano for some fun shopping! I would most like to win the heater! I am excited about the food pouches! Zutano! Their stuff is SO cute! The $50 Gift Certificate to Zutano would be great! I would buy my son some cute clothes. Most excited about the Zutano GC, and the Heater! Love the Squeeze Packs and Zutano GC! I'm excited about the gift certificate to zutano! The Zutano gift card and the toothbrushes! The ezsqueeze look really cool. I'm most excited about Zutano! The little heater for sure. Label me a nerd, but the bamboo toothbrushes seem absolutely incredible! The heater--we need a space heater & it would be fantastic to win it so we don't have to spend money on one. I'm excited about the Anna Little Heater! The EZ Squeezeez, I think. I've been seeing those online, but haven't gotten to check them out in person yet. Most excited about the Zutano gift card. I'm most excited about the food pouches. We live in a hundred year-old house--I'm excited about the heater! All of them!! But I think we'd love the EZsqueeze since my son LOVES those pouches. The zutano gift certificate! I can't believe how fast we go through clothing! Ezsqeezeese for upcoming travel is what I'm most excited about. i am most excited about the zutano gift card - LOVE zutano! The heater looks awesome to me! I am most excited about the Anna Little Heater! the zutano gift card would be what i am excited to win. The Zutano Gift Card! Love their stuff! Most excited about the bamboo toothbrushes! Call me crazy, but I'm excited about the toothbrushes. i want the zutano gift card! The Zutano gift card, they have such cute stuff! I am most excited about the Stadler Form Anna Little Heater. It would warm up some chilled fingers and toes in my house here in the Central North part of US! I'm really excited about the Stadler Form Anna Little Heater! I am most excited for the EZSqueezes! I could use anything but the gift card sounds amazing! most excited about the zutano gc. their stuff is so cute. I'm excited about the Zutano gift certificate! The EZ Squeezees are genius! I'd love the Little Heater! I'm most excited about the Zutano gift certificate! the gc to zutano would be amazing! i love their clothes! I'm excited about the Anna Little Heater. I'm most excited about the toothbrushes. I am most excited about the Stadler Form Anna Little Heater. Excited about the gift certificate! I'm excited about the heater! The heater for sure..especially living in New England! The Zutano GC! I love Zutano! They all look great but I'd love the heater. I'm most excited about the gift card. Thank you for this giveaway. I am excited about the $50 Gift Certificate to Zutano! I am most excited about the Zutano gift certificate! I would love the Zutano clothes for my toddler. I am most excited about the Stadler Form heater. the heater -- we are having trouble keeping our baby's room a consistent temperature! I'm most excited about the Anna Little Heater!